Jewish Wedding Photography is full of cultural traditions, rituals, and celebrations. 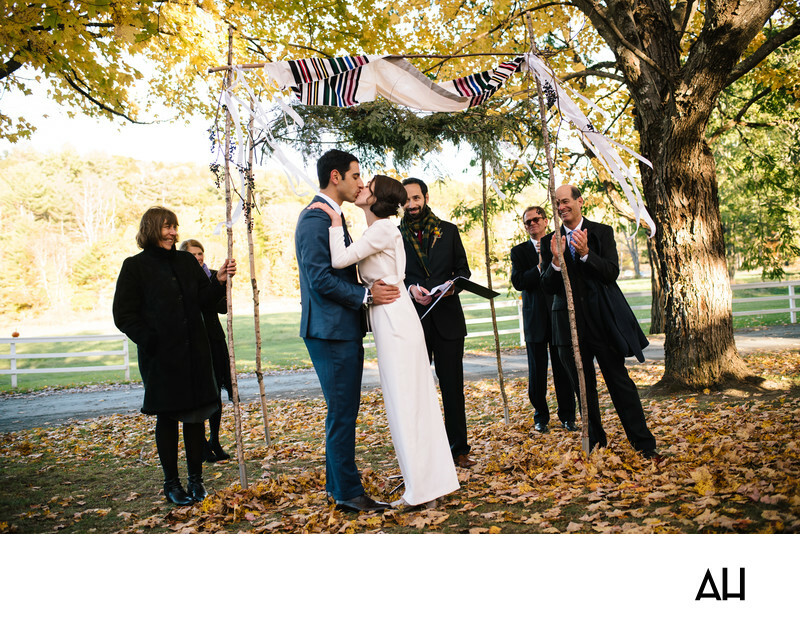 This Jewish wedding ceremony took place outdoors at the Quechee Inn at Marshland Farm in Vermont. It was a fall wedding, with the leaves on the trees surrounding the ceremony bursting with vibrant autumn colors. Sunlight illuminates the background of the setting and tangos with tree branches to shine on the husband and wife to be. Fallen leaves of yellow, orange, and brown crunched under the feet of the bride and groom as they said their vows under the chuppah. The chuppah was made simply, with long, thin branches and delicate leaves. A tallit hangs from the branches, creating the canopy the couple stands beneath. White ribbons attached to the branches that make up the chuppah dance in the breeze, and the four people who stand by to support the dainty structure keep warm in jackets and scarves. The Vermont air has already become a bit chilly as winter begins to approach, but the love in the hearts of the bride and groom keep them warm. The groom wears a navy colored suit with a black tie, and the bride a chic ivory gown with long sleeves and a high neck that further protect her from the cold. The bride’s dark hair is swept into a low updo, with a few curls escaping to gently brush against her cheeks. In this picture the bride places her hands on the groom’s shoulders and rises up to her tiptoes to kiss her new husband. Those who look on smile in affection and shared joy. It is a canid and happy moment, set against the picturesque setting of a quaint Vermont inn.